Google Chrome and Safari keep a cache of the things they've downloaded and they store that on your device. They do this to help you load frequently visited websites faster and more efficiently, but sometimes the cache is out-of-date, which can result in a less ideal or broken experience. If you're experiencing any trouble with Streak, we recommend you try clearing your browser's cache as a first step. You can refresh (or clear) your browser's cache in a number of different ways. Google Chrome gives you two options to clear your cache. We recommend the less destructive "Empty Cache and Hard Reload" which will only affect the website that you're on. Open the developer tools window in Google Chrome. You can do this by opening the three-dot menu in the top-right corner, hovering over "More Tools" and selecting "Developer Tools." Ignoring the new window, right click the Refresh button in your browser window. 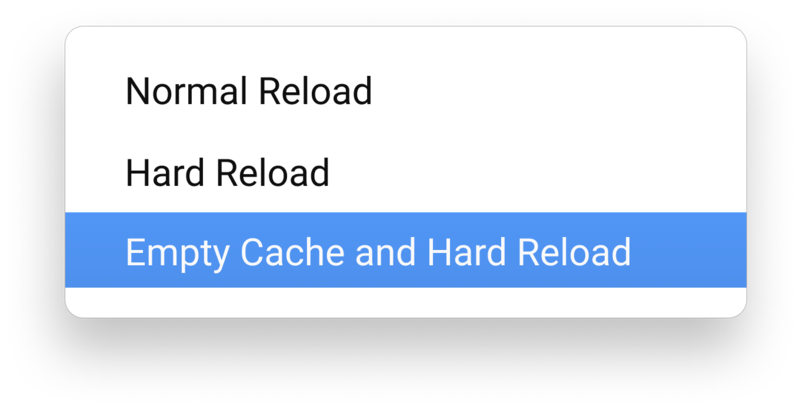 Choose the final option – "Empty Cache and Hard Reload." Another method, though more destructive, is to clear your browser's entire cache. We do not recommend this method unless it's absolutely necessary. Scroll down until you reach Advanced at the bottom and click to unfurl it. Under "Privacy Settings," select "Clear browsing data" from the list. Under the Basic tab, select a time range of "All time" with only "Cookies and other site data" and "Cached images and files" checked. Confirm your choice by clicking "Clear data" from this window. Safari has one option for clearing your browser's cache. We recommend using the keyboard shortcut for most users, as it's simple to press Option + Command + E and follow it up with a Refresh. If keyboard shortcuts are troublesome, though, these steps will help you clear Safari's cache through it's interface. In the new window, open the Advanced tab. At the bottom of the window, check the option for "Show Develop menu in menu bar." From the new menu bar entry for Develop, select "Empty Caches." Let us know! You can reach us through chat or via email at support@streak.com.